I need to install Antergos and I’m totally a newbie into Linux world. I have Windows 7 x64 in Legacy mode and I need to install Antergos alongside with it. 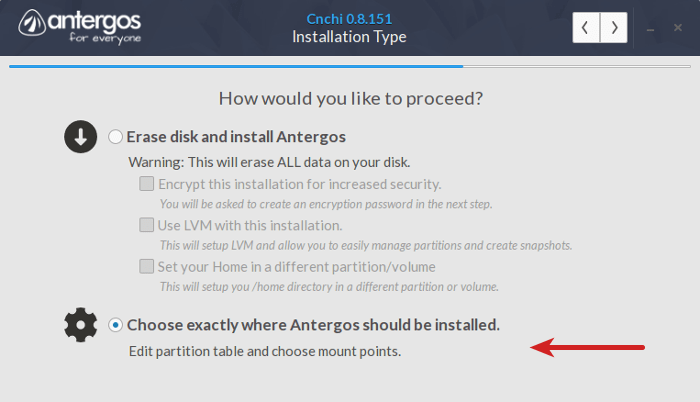 My question : during partitionning, should I create a boot partition or Antergos will create it automatically? @joekamprad Thanks for your fast answer! Yes, I will create dualbooting and Antergos will be indeed on the same HD as Windows. And how to mount /boot under / if I don’t create it? home and also boot will be created under / automaticly, as directories. Take care to do not erase or format your Windows partition (ntfs) and create free space by shrinking the Windows drive beforehand the installation ! On legacy BIOS you will install Antergos grub (bootmanager) code into the MBR of the disk what will have boot entries for Antergos and Windows then. @joekamprad Thank you very much! It’s very clear now! just to be sure-- does it mean I must check “Use the device below for boot loader installation”, then select Grub2 as bootloader and /dev/sda as Device? For safety’s sake, please make (in Windows) a good backup of all your personal data before making anything else! It is so easy to make serious errors e.g. in partitioning. Another thing that probably is wise to do: create a Windows recovery disk (in Windows) right after making the backup mentioned above. That helps you recover Windows booting (MBR) if something goes wrong. Even the swap partition is not strictly necessary, as you can use a swap file. So as a minimum for Antergos, you need to have only the root partition, marked as “/”. Anything else is just optimizing and depends on your system. No problem, you already helped me a lot! Yes, that’s what I will do, thanks! Yes, I’ve read a lot of tutorials about that. I will try a full installation following all your advices ( @joekamprad @manuel ), thanks for your help!